The popular Chaekkori (책거리) paintings of the Joseon Dynasty (1392-1910) are a symbol of the knowledge and wealth permeating Korea during this time. The demand for the screens spread from the palace throughout Korea just as fashions of the time so often did. Chaekkori (책거리) screens were first placed behind every desk in the men’s quarters of the palace and not soon after every gentry household decorated their rooms in the same fashion. Rising demand for these screens led to the rise of professional court painters such as Kim Hong-do (1745-? ), one of the Joseon Dynasty’s three greatest painters. There are three principal types of Chaekkori (책거리) compositional formats that are found in both court and folk screens. The first and most elegant type represented a bookcase. In this motif, artists were able to use linear perspective and chiaroscuro to make themore graphic. The second type of Chaekkori (책거리) is the isolated format where scholar’s objects float against a blank background. The objects included, such as ceramics, flowers, and fruits are all allusions to books whose volumes they are painted alongside. Also included are representations of incense burners which were popular with scholars because of the rise of Confucianism, their use in ancestral worship, and their use in educational study. The third type is the tabletop format in which objects are placed on or around a table surface to ground the image in space. 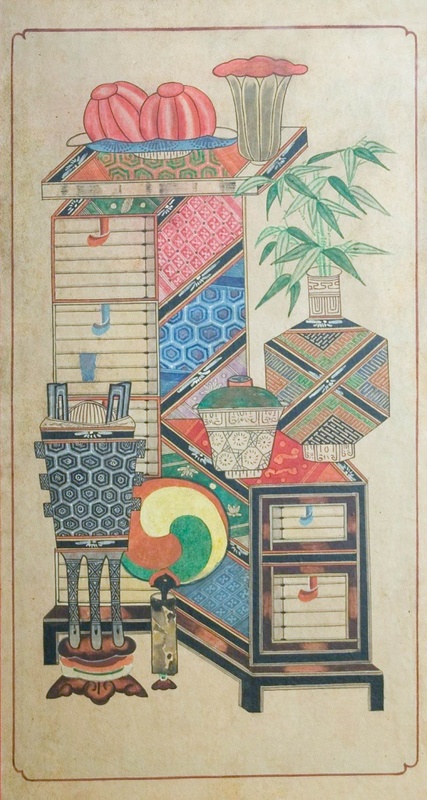 Because Chaekkori (책거리) were popular during the late 18th Century, they were influenced by the styles of China which at the time had begun to introduce Western elements into painting. 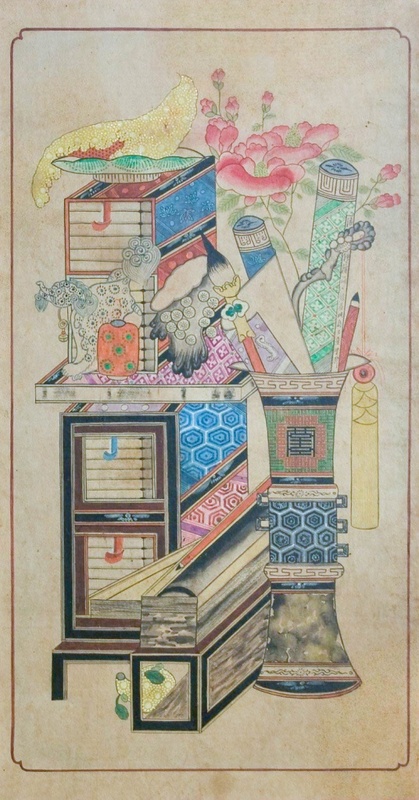 Korean Chaekkori (책거리) themes almost always depict scholarly paraphernalia - books, bronzes, ceramics, flower arrangements, bowls of fruit and miniature land scapes - all of which are appropriate for a Confucian scholar’s study during the Joseon Dynasty (1392-1910). Always present throughout were “The Four Friends of the Scholar” - paper, ink, brush, and inkstone. Although the subject matter is secular in nature, the artists wielded freedom to choose from a vast array of items and to determine which ones and how many he wished to paint. While some objects might be seen to carry religious connotation because of their association with Buddhism and Taoism, by the Joseon period they simply conveyed auspicious wishes. A selection of Chaekkori (책거리) screens will go on sale August 10 - 24th on iGavel Auctions.